Coming into the year, the most important chart I was watching was the U.S. dollar. As far as risk appetite was concerned, I felt the dollar would be a great tell. 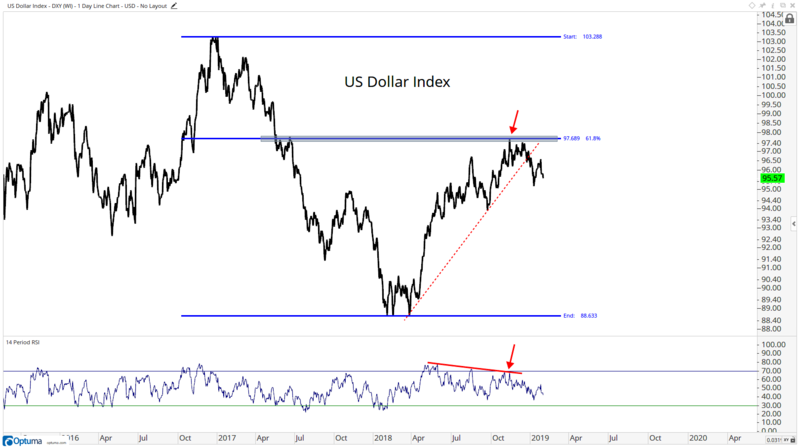 The way I saw it, the dollar rallied throughout 2018 to achieve its upside objective and then broke the uptrend line from those former lows. If we were to just rip through those key levels without at least some kind of pause or consolidation, it would most likely be because of a tremendous flight to safety. And stocks would probably be doing poorly under those conditions. But flip that thesis upside down, and a weaker dollar would most likely mean strength in stocks. With a bearish momentum divergence and all of this overhead supply, I am not in the camp that the U.S. dollar goes higher. It still looks like overwhelming selling pressure to me. Let’s remember that the euro represents about 60% of the entire U.S. Dollar Index, so if dollars get hit, the euro should do well. First of all, prices the past few months have flirted with potential support from that resistance, or “overhead supply” in 2015 and 2016 near 1.14. That’s where we are today, holding just above that 200-week moving average. Will our Polarity Principles come into play and former resistance will become support? That seems to be the higher probability outcome. We look at a lot of sentiment data and aggregate it all together from a variety of sources. 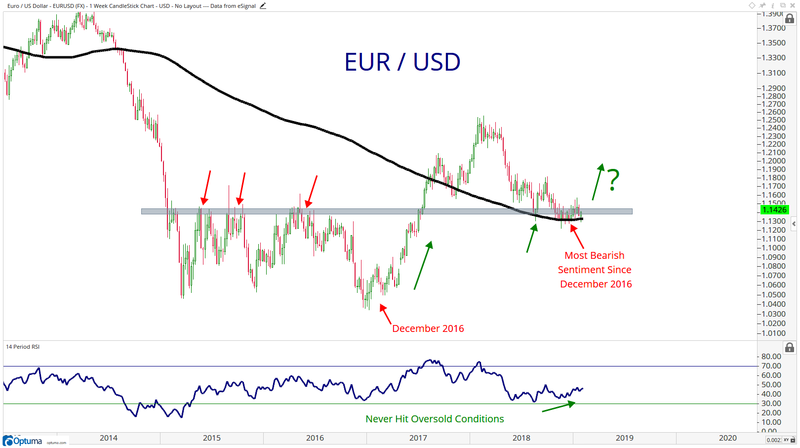 From our perspective, sentiment hasn’t been this bearish towards the euro since December 2016, right before it rallied over 20%, which is an astronomical move in the currency world. Also notice how momentum never got oversold during the correction over the past year. This is evidence of strength, if you ask me, especially with the lower lows in price in November and a higher low simultaneously in momentum. The positive correlation between the euro and stocks is not always the case throughout history, but it’s hard to argue that it’s not the case now. 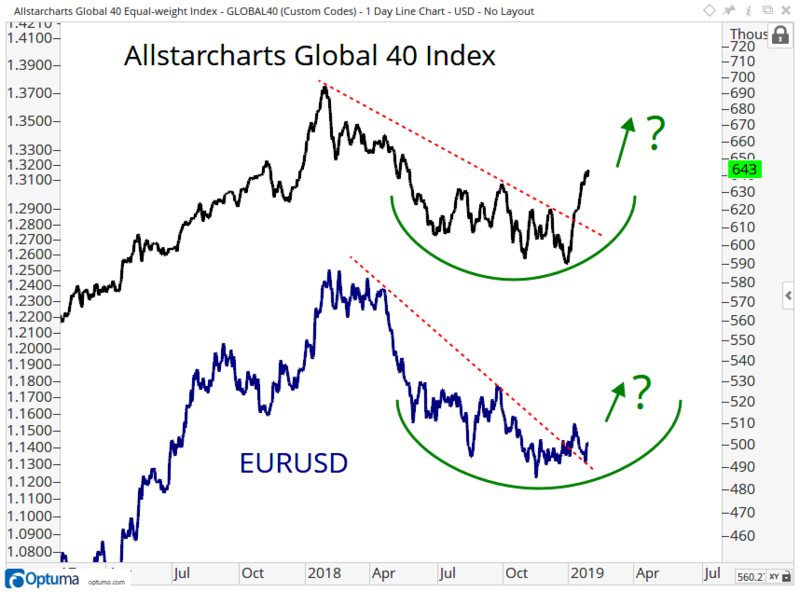 If EUR/USD is above 1.14, I think we need to continue to be constructive towards stocks and looking to take further advantage of a weaker dollar. If that 1.14 starts to break and this becomes a disaster for euro, then we can talk about some bigger structural issues for stocks. That’s what I’m seeing out there. For us, it was a currency thing coming into 2019 and I still think it is today.